Instagram is a social network that was launched back in 2012, but since then, a growing number of third-party apps for Instagram are available on the Google Play Store. 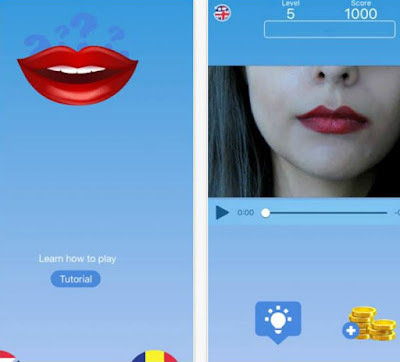 These apps promise to improve its aspects which displease some users: they add additional editing options, advanced features (like time lapse support), collage-like layouts, and even scheduling options for Instagram posts. In short, these third-party applications can make the Instagram experience even better. One of those fantastic apps that are not affiliated, funded or in any way associated with Instagram is the InstaLord app. We chose it to present to you because it offers an amazing option or us to download and share Instagram photos and videos, which obviously is not possible directly through the app. Thanks to its developers, HMA Labs, we can now enjoy an easy to use app on both our Android phones and tablets. All you have to do is install the app and follow few simple steps. That way you’ll be able to download videos and photos in highest quality from yours, your friends’ or from public figures’ Instagram profiles. Don’t forget to ask for permission first! Anything you download can be shared or reposted on your Instagram profile or to any other social media. Plus, the app features a media player and a notification system. You can download it for free from Google Play, no signing in and no ads, just click the link below. Can you imagine your life nowadays without social networking? No, we can’t too. Social media apps and platforms, such as Facebook, Twitter, Instagram, Snapchat, and many more have become essential to our lives, they all offer different things to do online. But what if we tell you that this December, the 26th to be more precise, the App Store and the Google Play Store will become hosts of one single place to go for everything you do online? We’re talking about an incredible social media app called SCREAMXO, which maybe you’ve already heard of. There is a reason for the hype, or better said – reasons! It will change the way we use social media due to its features, features that can help us organize, create and profit through a simple and intuitive user interface. What a Christmas gift, right? SCREAMXO is created with 5 main sections or tabs: Media Buffet, Shop, Stream, Time, and Social. Media Buffet allows the users to share and upload multimedia content, Shop is an e-commerce store, Stream is a micro blogging feature, Time is a way to change how long your media and chat content stays visible, and Social is an easy-to-use instant messenger. Additionally, you are not restricted and limited to 140 characters like on Twitter – you can express your thoughts completely, and you can auto-delete your social media updates within a period of time you specify. So far, access to the SCREAMXO app is by subscription-only, so you can sign up on screamxo.com and be a part of the grand launch this Christmas! Text messages never got out of fashion, they are still the quickest and easiest ways to reach someone. Although there are thousands of messaging apps in the App Store, we’ve managed to pick only one to present to you today, called Nanimea. 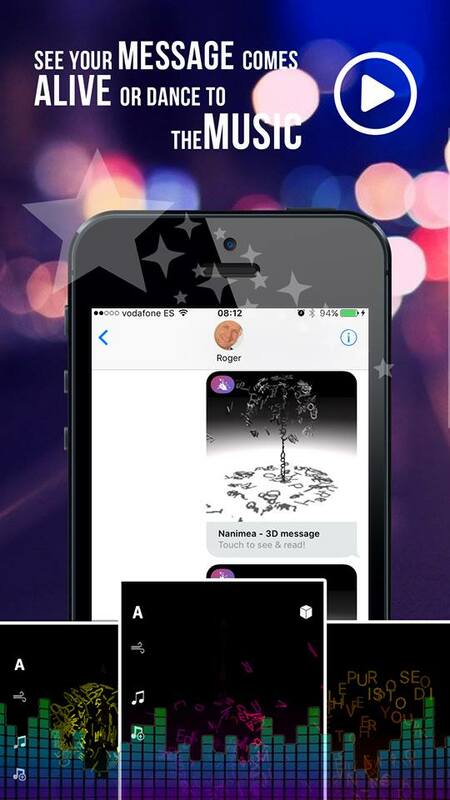 Thanks to an Indie developer, Roger Boesch, iOS users can now enjoy an innovative and fun way of texting. The Nanimea app allows you to send individual text-messages in the form of interactive hearts, flowers and many more, in a playful and engaging way. With it, you are able to amaze your friends and family with more personal SMS and wonderful pieces of 3D art. How it works? Quite simple you see, it only requires of you to write down your message, choose the color and choose the model you like. Then watch how your letters transform into a beautiful 3D message. The message can be sent directly to whoever you like through iMessage. Note that Nanimea lets its users to write down their messages in multiple languages, such as English, German, French, Italian, Spanish, Malay, Indonesian, etc. Offering iMessage App for iOS and a new texting experience that anyone would love, the app is completely free for download on the App Store! Game developers launch so many games on both of the App Store that it’s difficult to keep a track of everything. That’s why we’re pretty sure you’ve missed one of the best games of this month, a game called Circularity. This is an extremely addictive game, suited for both casual and more dedicated gamers, and designed with stunning HD graphics. Plus, it goes along with fun soundtrack and sound effects which add up to the engagement. Now, let’s share a few words about the gameplay, but we highly recommend you to try it out for yourself. 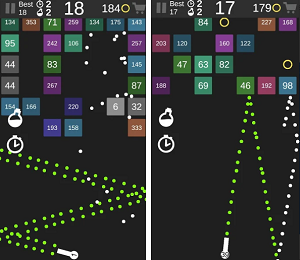 It features 15 exciting and challenging levels, all using simple navigation mechanic. Your mission is to get your ball to the exit as fast as possible by only tapping on your screen. While doing that, watch out from the obstacles that can make you lose the game. Good precision and timing skills are required of you, so show your best and get the highest scores as possible. Additionally, you can compare your best times against other players on the game’s global leaderboard and of course, you can share it with your friends. The greatest thing of all is that you don’t have to pay anything because Circularity is completely free for download. Get it now, just click the links below. 1Code was probably the best and most useful app we reviewed this month. 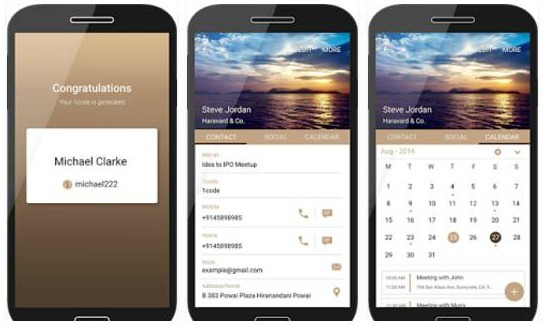 It is a revolutionary productivity tool which allows its users to share contact information and schedule meetings in a faster, easier and less stressful way. The main idea of the developer team was to create an app that will solve our problems of exchanging contact information and believe us, they had an enormous success. They focused on creating efficient, convenient and simple solution, designed with clean user interface and easy to use features. 1code is really helpful for the people that frequently exchange contacts and live a busy life. We can relate to and we have been using this app frequently in the last month. You should get it if you want to simplify the way you share, organize, update your contact information and set up meetings with your contacts this is the perfect way to do it. All you have to do is download the app, choose your name an existing Gmail, or twitter username as your 1code and start sharing it in person or virtually. Share your contact info with anyone you like, receive theirs and change your contact info (your selected group of contacts will have the updated information automatically). You can also share your calendar with anyone you want, so they can always know when you are busy and free. 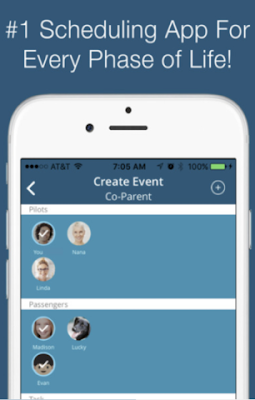 Sharing contact information and scheduling meetings has never been easier! That’s why we highly recommend you to download 1code – it is available on both App Store and Google Play. 'Shape it' focuses less on clay building and more on storytelling. The app's content concentrates on the characteristics of children who come up with many stories to add life to the clay sculptures that they make. CEO Seok Hee-young was disappointed to see that clay content was still stuck in one-dimensional courses that used paperback manuals: after all, the world has entered a digital age, and the educational environment of children is changing. She came up with "Shape it" so that children could have more fun with clay while developing their learning capabilities. In the 'Shape it' beta version launched in the Google Play Store, users can make clay artwork by following the video. In December, the app will add a function so that users can experience augmented reality (AR) with the clay sculptures they've made. In January of next year, it will offer a tool to make Claymation (clay + animation) videos so that users can share them with their friends. Seok Hee-young developed the app to help children develop their creativity, saying that "'Shape It' will help children express their imagination like Steven Spielberg and Tim Burton." She added, "CLAY FINGERS places value on the importance of storytelling created by children, and we will be a company that strives to help children imagine as much as they want, while becoming the Lego of the clay market." These days, everyone is “on-the-go” and chances are if you own a smartphone you’ve recognized the fact that you’ve got a lot going on and you don’t have the time to sit in front of your computer trying to get your music to the masses. That’s why we found an app for any musician that wants to stay connected and enhance their career, even if they’re on the train, in the waiting room at the doctor’s office, or waiting to meet with the executive of a record label. It is especially created for indie and underground artists that want to promote their music without being overshadowed by the music industry. The app’s name is 50Artist50States, designed for all Android, Windows and iOS users out there. The developers put a huge effort in making something to get you heard, gain fans and most importantly, to let your hard work get you signed. All you have to do is install it on your device and start uploading your tracks and singles. The music genre does not matter, as long as your tracks are hot! Plus, each track you upload will be presented with direct links to your Twitter and Soundcloud pages, so you can get even more followers. The ultimate radio channel for underground artists is here, and it is completely free of charge. Get it today from the App Store, from Google Play, or from the Windows App Store! Sports apps put the latest news, schedules, and statistics just a tap away, accompanied with hi-res pictures, podcasts and sometimes, even live-streamed video of the action. Having a great sports app is an amazing thing for the real sports fan. Thus, today we are recommending you a new sports app that is soon to be released. 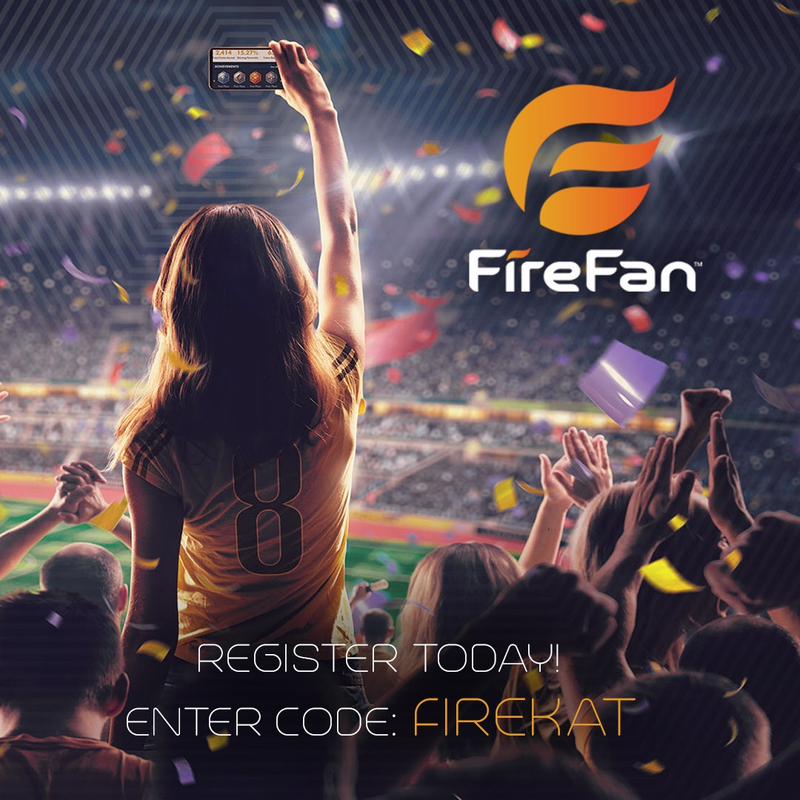 FireFan is a free mobile app for playing real time fantasy sports. Allows you to play live during real sporting events. Play along with your favorite teams and compete with your friends, family, and even Pro Athletes Live. The official launch date has yet to be announced but look for it in the fall of 2016. Be sure to register here for it to get instant access once it drops. 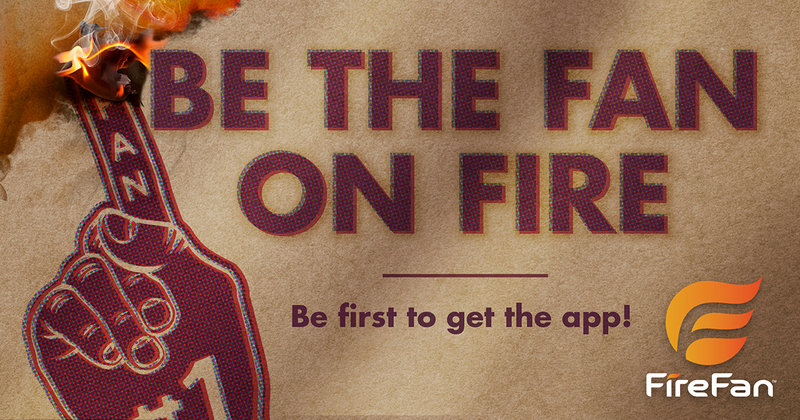 Update: Looks like the FireFan app will be released in the Plan and Apple stores the week of Nov 21, 2016. 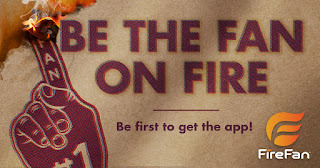 Pretty excited about this and to see what additionally FireFan has to offer. We're heading into winter, but that's no reason to get lazy and abandon your beach body. Fitness apps such as running trackers, weightlifting journals, and workout guides, turn your smartphone into a portable exercise companion, helping you stay in shape and live a healthy, active lifestyle. So buckle up and get ready to be introduced with one of the best and most useful iOS apps for improving your overall health and getting the body you’ve always wanted! We’re talking about Train.Me, a wonderful and feature-rich fitness and workout app, brought to all of us by an experienced certified personal trainer. So we can say that the app itself is a portable personal trainer that can be used at the gym or at the comfort of your own home, it’s up to you. Train.Me consists of many innovative exercises, effective workout programs, nutrition advices, tips and tricks, and many more. Each built-in exercise is presented with a description in a step-by-step concept, with HD images, and fully customized according to your previously chosen goal: Lose Fat, Tone Muscle, or Gain Muscle. Also, it provides you with an option to track your measurements, weight loss and gains, to save before and after photos of you, to calculate your body fat percentage and to store everything into your personal account. For full access to all of the features we’ve mentioned before, you have to download the app from the App Store. Don’t worry, it is completely free of charge, just click the link below that we’ve provided for you. "Great Very amusing and interesting game took me hours a day!!" When it comes to the best music streaming apps, the conversation usually revolves around the battle between Spotify and Apple Music. But there are a lot of other apps out there. Which music streaming app is best suited for your needs? We have just the one you need! Songstream is one of the best music streaming apps on the App Store, compatible with both iPhone and iPad. It helps you find any song, at any time, everything for free! The developers managed to design it with beautiful graphics, clean UI and filled it with great features which are easy to use. First of all, the app features a music player for you to listen to your favorite tracks from your favorite music artists. The content is provided by YouTube, so you can search whatever you like, discover trending music and stream any song. Additionally, you can add songs to the Favorite or the queue section, create and name playlists, add and organize songs to your playlists, or follow and listen to public playlists. The songs and entire playlists can be shuffled and repeated, they can play in the background and can be shared via any social media you’re using. Download Songstream for free from the App Store and enjoy your favorite songs like you’ve never did before! - Users that want to play piano for fun. Playing notes an octave apart and many more..
"piano lessons app I love it so much I learned piano because of this, when I got to the concert, I won, it's just because of this!" Dating apps have transformed the way we online date. We’re no longer limited to finding someone special in front of our desktop at home — we can now do that while standing in line at Starbucks, walking the dog, and even using the bathroom (if that’s your style). Besides the convenience dating apps have brought into our lives, there are also ones that are saving us money while we search for a hookup, date, relationship, or whatever else our heart desires. That’s why today we’re presenting to you a completely free app which was released on the iOS platform by the developers over at CRISTAL NEXUS PTY LTD. The app is called HookUp! and it is one of the finest apps that let you chat and meet with single and like-minded people from your area. 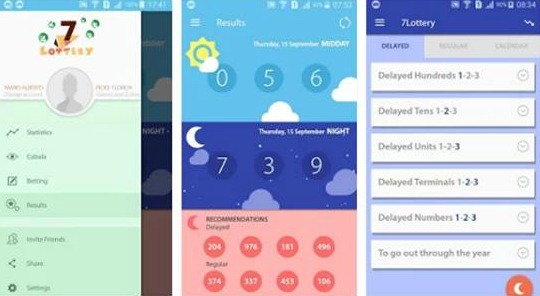 The app is easy to use, intuitive and has great design. The only thing it requires is your signup, but unlike other apps that ask too many questions and complicate this process, HookUp! only needs register with your email address or with your Facebook account. When you’re done, just add some photos of you so other people can see how you look like and go on with the swiping! Swipe left for nah or right for yah, chat, talk, flirt, meet and date single people from your area, meet singles for love, romance, a dinner date, everything you like! Prepare for the future of dating, download the HookUp! app for free from the App Store and enjoy! App Store Download Link: HookUp! The hit dating simulation game ‘Princess Evangile’ is following up their visual novel with a puzzle game that is sure to take the global market by storm. Iplay (CEO Park Jung-won) recently announced that ‘Evangile 2048’ has been released to the global market. ‘Evangel 2048’ recreates the characters, voices and illustrations of ‘Princess Evangile,’ originally a Japanese visual novel, into a 2048 puzzle type game. Various illustrations and the voices of pretty girls, which have never before been seen in a 2048 game, were included to make this 2048 game more captivating and fun than others in genre. Interestingly, you can see the best scenes from ‘Princess Evangile’ in illustrations that are optimized for mobile devices. Beyond the game, you can also see various visual novels and comics that have been released by Iplay by pressing a button in the game. Iplay has released a number of hit visual novels, including ‘Princess Evangile’ and ‘Kuon no Kizuna,’ and recently signed a contract with Nippon Ichi Soft, which is famous for the ‘Hayarigami’ series and ‘Disugaia’ series, and is spreading more Japanese game contents services. Best Search is Image Search Client for Google Search on Appstore. With Best Search You can easily take pictures and search immediately. You can select a picture from the library and search. Whatsapp is undoubtedly the most popular chat app worldwide with over 1 billion users. Its simple interface makes it popular among all people. We can send photos, videos and songs to the other people via WhatsApp at a lightning speed. No doubt Whatsapp has become part of people’s life. With the advent of dual sim phone people have dire need to run 2 or more WhatsApp in one phone. Also many people use multiple devices like tablet and phone so they need two accounts and more than two accounts. There are many people who likes to segregate their personal life from professional life. Hence they require to use two Whatsapp accounts for this reason. More than one account : I am talking about Dual Whazaap which supports multi accounts simultaneously. You can literally use both accounts at the same time in your single device , mobile or tablet . It does not require your sim card to be inside it. Small APK size: Many phones,with limited memory space, make it difficult for people to install apps in a bigger But you don’t need to worry about it at all here. The APK file of Dual Whazaap is just 4 MB, concise and also very easy to install in your devices. No Data Conflict: Both WhatsApp accounts work independently with each other so there is guarantee of no data conflict with independent data storage for each account. Switch Usage: The app provides a swift usage for fast navigation and switches accounts instantly in app or over notification bar. No root required: Dual Whazaap does not require your root access to run the second WhatsApp in your phone. It is much safer and stable. No extra mobile flow: Dual Whazaap itself will not consume mobile flow but the second WhatsApp will do as usual. No more worry about extra flow charge. And this is it? Not yet. The possibilities are endless. Yes, with this app you can create as many WhatsApp accounts as you want. Isn’t it great? How about one Whatsapp for professional use , another for friends and family and also another for the girl you met last night at the bar. Most time you don’t want to give access to your privacy to strangers. This is the best solution for you. There is currently no other app in the market which provides you unlimited WhatsApp account creation options. But here you get one-Multi Whazaap. After smartphone coming into being, most people are addicted to their phones, and finally a phrase emerged as mobile freak. Mobile freaks do almost everything on their phone and WhatsApp is a must to them. So here comes the demand of more WhatsApp accounts on one phone.Compared with Dual Whazaap, Multi Whazaap definitely gives more that what you want. Unlimited WhatsApp Accounts: Thousands of friends in WhatsApp is no longer a problem. Divide your friends according to your demands into the groups of friends, family, work, strangers and numbers of girlfriends. Create an account for each group and your life is simpler and cozier. Quick switch between accounts: In Multi Whazaap, your WhatsApp accounts will be named as WhatsApp01, WhatsApp02, WhatsApp03 and so on. Tap any one to switch between accounts without hassle. Multi Whazaap, developed by the same developer with Dual Whazaap, includes all the features in Dual Whazaap. Well, the usage is also alike. Download Dual Whazaap and Multi Whazaap as you like. Run Dual Whazaap or Multi Whazaap in your phone. Tap “Open” to create your second WhatsApp or “Build” to create your second, third and more WhatsApp accounts. Enter your phone number and verify one by one. Complete your profile with name and avatar and start your Dual Whazaap, Multi Whazaap tour now. 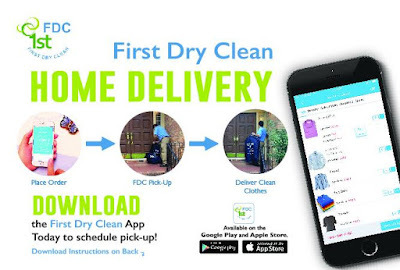 Few days ago we reviewed First Dry Clean, iOS and Android app for ordering dry cleaning service. Because of the great set of features and usability, we decided to make it App of the Wee. Why? It’s a common quip that technology was designed to make our lives easier, but it often does the opposite. While that’s true in some cases—we’ve all had our computers quit on us resulting is lost work—there are also hundreds of life-simplifying apps that can literally change the way we work and live. One of the things that are most time-consuming is doing laundry and dry cleaning. You don’t need to worry anymore because we’ve found the perfect solution, an amazing app called First Dry Clean. This is actually the first pickup and delivery dry cleaning and laundry service app on both Android and iOS platforms. It is simple, easy to use and intuitive, and it is succeeding in its mission – to make our lives easier and to make us do what we really like instead of doing laundry. The app only requires your sign up with your mobile number. Then you can start dividing and ordering whatever you need. Add the clothes you need cleaned in your Laundry Basket, tap finish and submit and wait for the app’s team to come to your place and collect them. You will get your clothes back freshly laundered, within the next 48 hours after the pickup. The app features almost every clothes and items available, from bottoms and household to wash/fold and suit and uniform. With these incredible features and many more included, the First Dry Clean app can be downloaded for free from both Google Play and the App Store. Save your most valuable asset, your time, get the app today! It is one of the best dry cleaning Charlotte service. Since the dawn of time, gold and silver have been recognized as valuable. And even today, precious metals have their place in a savvy investor's portfolio. But which precious metal is best for investment purposes? And why are they so volatile? There are many ways to buy into precious metals like gold, silver and platinum and a host of good reasons why you should give in to the treasure hunt. If you're just getting started in precious metals, you may as well use a powerful tool to help you out. 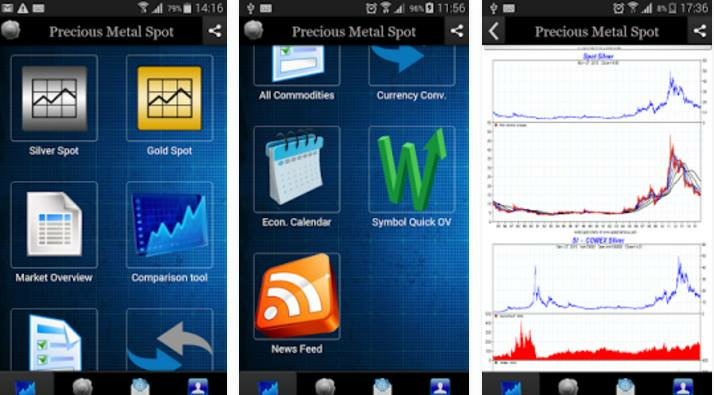 We have the perfect recommendation for you, a wonderful cross-platform app called Precious Metal Spot. Developed by the company Metal Silver & Co and extremely easy to use, this app is one of the most powerful financial analysis tools that we’ve ever seen. It provides with multiple features related to gold, silver and platinum stock markets. The Precious Metal Spot app consist of gold and silver live covering, amazing comparative and fully interactive charts for the gold, the silver and the platinum market leading stocks, a currency converter tool with all currencies built-in, quick symbol overviews where you can watch over your favorite stocks and shares, precious metal companies, etc. You can get updated from the general activities of the precious metal stock market and learn about their history as well. You can download the app for free from the links we provided below, and enjoy a great user experience! We all know which social apps are the most popular ones, but have you asked yourself do they create engagement with other apps? The answer is no, but don’t worry, we have found the perfect solution to this problem, an app that actively engages people with similar interests into one big vivid community. The app that we loved so much is called Crowd’s Feed, available for all Android users who want to chat, meet and talk with friends from common apps. It is created by the developers over at Casific, it requires Android 3.0 and up and it is presented with stunning graphics and friendly user interface. All you have to do is download and install the app. Then, the app’s icon (a floating layer) will be added above the other apps in use on your device. Tap the icon from any app to open Crowd's Feed which presents content of users who also tapped the icon from the same chat app, and you’re done, it’s that simple! This way you’ll get to know your users and find out what matters most to them, increase your user engagements, add unique rich media to user feeds in sections & articles of your choice, and much more. Explore interesting and fun content posted by people who use the same apps as you do, share your experiences, get Crowd’s Feed for free from Google Play! From games and television shows to movies and comics, it’s clear as day we’re all hooked on zombies. Love it or hate it, this craze has no end in sight. Are you infected like the rest of us? Looking to get your z-wars on? Get your iPhone or iPad in your hands and prepare yourself for one of the best zombie themed games on the iOS platform! We present to you Zombie SkyKiller, a thrilling shooting game that gives you the chance to become the ultimate hero and save the living people in the zombie wasteland. This game is created by Dentonite Studios, who put a huge effort in making this game challenging and entertaining at the same time. They also did a great job in the game’s design – it features wonderful HD graphics and interesting sounds. In Zombie SkyKiller you get to play as an aerial shooter, who has one goal: to keep the zombies away for a certain amount of time, shoot them with your weapons and save the living survivors. You’ll have to show your best precision skills and you’ll have to be prepared for all kinds of challenges – it can get messy from time to time! Don’t let them outnumber you, use wisely your guns and missiles, and try to earn as many medals and achievements as you can. If you want to enjoy this unique and exciting zombie themed shooter, you should get it from the App Store, where it is available in two versions: free and paid (ad-free). Let’s face it. Most people like to play the lottery, at least from time to time. While playing is fun, actually winning is much more exhilarating. For most of us winning is simply a chance occurrence, a stroke of luck. However, other winners admit that they can predict the best lottery numbers to play. How? Is it truly possible to make accurate predictions for lottery numbers that will win? Yes, if you have the right app in your pocket! There aren't a lot of lottery apps on the Android platform and even with the small selection, there really aren't many good ones. Luckily we've found one that’s even beyond our expectations, called 7 Lottery – Lotto Prediction & Results. If you live in the USA and you’re playing lottery games, such as Pick 3, Cash 3, Daily 3, Play 3, DC 3, Pega 3, Pick 2, Pega 2, this is the perfect solution for you. With friendly user interface, this app offers lotto statistic, lotto number generator, lotto prediction, lotto suggestion and lotto results. The 7 Lottery – Lotto Prediction app consists of many features that you can find useful. For instance, it allows you to check the necessary data to make a safe bet and see what numbers have not appeared or how many times certain numbers have appeared, you can learn how to translate everything mystical or events into lucky numbers by interpreting your dreams into numbers and the numbers associated with your birth month, the value of the days and months, as well as your lucky days according to your birth date. You can also find all the options to save and keep your bets, and you have the opportunity to view the most likely to bet numbers on the lottery games, etc. Best of all, 7 Lottery – Lotto Prediction is free for download on Google Play, but you can get its PRO version for free in the first month, but after that you’ll need to annually subscribe for only $1. Isn’t that amazing? Get it today and be the lucky winner! - Users that want short inspirational videos, bible verses and ability to take notes in one app. Schedule and receive up to 12 messages each day in a variety of forms--text, audio and video. Push notifications ensure you don't miss a single message. Save your favorites and share via social media. Write down your thoughts on the content using the notes feature. Reviewed several days ago on our website, Tower Defense is still one of the most played games in our offices. Well, maybe it is because of the fact that we love tower defense games. For as long as there have been towers, we have been raining destruction down upon our enemies from atop them. Tower defense games combine action, strategy, and not a little bit of stress as you try to keep enemies from reaching their objective through the use of building and upgrading your defenses. The good news is, if you’re looking for the best tower defense games online, you’ve come to the right place! The bad news… ? Say goodbye to your free time. Most of us remember spending tons of hours on our old computers, smashing “z” and “/” like maniacs sometimes for hours on end. Well if you thought that was that the golden age of pinball games is over and done for, think again. Thanks to games like the one that we will be talking about in this post, the spirit of pinball never fades away. The game that we are talking about is called Pinball BOOM. It is a free to play pinball game for all android and iPhone users to enjoy. 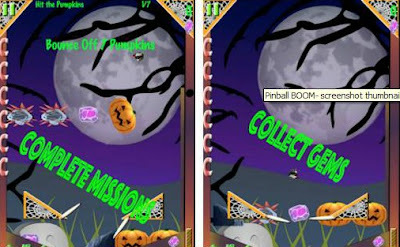 The game features fun kid-friendly graphics and a rich and entertaining Halloween theme. Unlike other pinball games, you have bonus challenges to each round. There is an endless wave of obstacles that you have to tackle in order to progress through the game. By completing missions you earn gems. You can also use special powers in order to help yourself in difficult obstacles. If you are a competitive person, you can collect all the Halloween costumes and attempt to reach the highest score. We highly recommend Pinball BOOM for all true pinball fans out there. If you want to find out more about the game, feel free to visit their official App Store or Google Play link, depending on your device. Before the digital camera revolution, a cell phone’s role in anyone’s daily life consisted of merely making phone calls, sending text messages, and drafting emails. Today, everyone has a supremely high-powered digital camera in their pocket or purse, capable of taking stunning panoramas at the swift touch of a finger. Though what good is a smartphone camera without the proper applications to get the most out of your photos? If you want to make your photos more beautiful and fun and if you want to gain more followers and get more likes on your social media accounts, we have the right app for you. Snap Photo Editor Pro Stickers lets you add stickers and text to your photos within few taps, offering you a great user experience and great design. 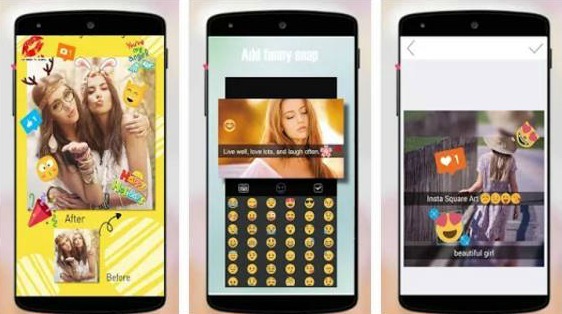 This app provides with a list full of trendy stickers, such as smileys, anime eyes, animal stickers, love stickers, hearts, kisses, flowers, tears, and many more, customizable text (you can change its color and font), you can save your edited photos in your device’s gallery or share it wherever you want – via e-mail, via Facebook, Instagram, or other social media page you’re using. All you have to do is download Snap Photo Editor Pro Stickers from Google Play and upload a photo from your gallery or take one with the app’s integrated camera button. Get it today and start creating beautiful images – it is free of charge! Notifications let you know how much time you have to get to each destination in an event and the notifications will give you directions from wherever you are. "Really Simple A great tool for managing conferences and events." See Me? – Show Everyone What You’re Thinking!